Home › digital skills › Digital Productivity for work, study and life. The Technology Enhanced Learning team recently ran a bitesize online course for University of Sussex staff looking at Digital Productivity. This blog post will explore some ideas around that topic. The course was conceived as a way to introduce staff to ways of working that take advantage of digital technologies to enhance or expand on practices they would previously have carried out manually. These techniques are equally useful for students and for ‘life admin’ for everyone. Do you work alone and/or as part of a team? What devices do you have access to (desktop computer, laptop, tablet, smartphone etc.)? How do you currently keep track of tasks and notes, communicate and collaborate? Are there any problems / pain points in your current way of doing things? Once you have an idea of what you might need or want, you can start to explore what is going to be most useful to you and/or your team. Digital productivity can be split roughly into 3 main areas: communication and collaboration; managing and organising tasks; making and organising notes. During the course we used Slack as a platform for sharing, discussing and supporting participants. If you have not seen Slack before this video will give you a quick overview. 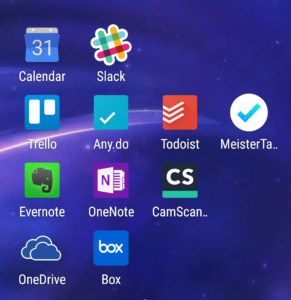 Slack also integrates with hundreds of other apps (see the Slack App Directory) so if you are already using some of the apps listed in the Slack App Directory there is scope to bring things together in one place. For University of Sussex staff and students Office 365 which includes OneDrive for storage and OneNote for notemaking and organisation is an obvious choice. With free versions of Microsoft Office for computers and mobile devices it offers an extensive package of collaboration tools and training courses are offered by ITS. Sussex staff and research students also have access to a Box account which allows you to share and collaborate on files. Cloud services like this, with mobile apps, allow us to keep track and organise our lives using phones and other mobile devices. A previous post, 3 steps to improving your time management with digital tools looked at ways that students and staff can be more organised, and hence productive, with their ‘to-dos’. At the time, we suggested Wunderlist as a useful app, but as Microsoft have taken over Wunderlist and have announced that it ‘will eventually be retired’ you might want to look at something else – Any.Do and Todoist are both good options that will let you organise all your tasks, from work to ‘life admin’, in one place. For a more visual display of tasks Trello is still an excellent choice for individuals and teams (see our previous review of Trello), but MeisterTask now offers similar functionality. There is very little difference between Trello and MeisterTask, but the latter will let you track time spent on tasks. If the people you work with are already using one or the other it is probably best to choose that one to make sharing tasks possible. If you want to give MeisterTask a try, there are many useful videos on the Meistertask YouTube channel. Staff and students at Sussex have free access to OneNote as part of Office 365 and there are many ways it can be used by students, teachers and administrators. The Technology Enhanced Learning team are happy to advise and support staff at the University of Sussex in developing their digital productivity. You can contact us on tel@sussex.ac.uk.